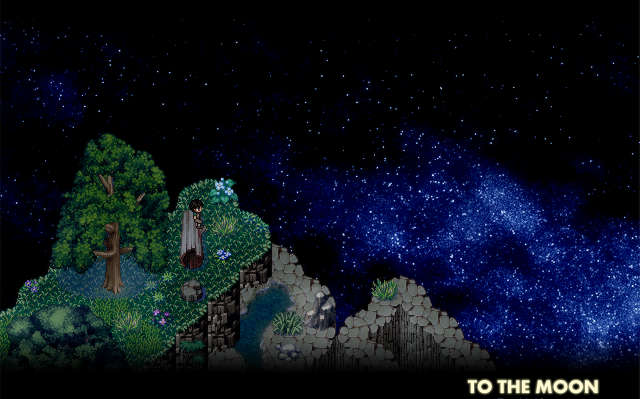 To the Moon is an excellent indie game available from developer freebird games. This is an analysis of its story. I've tried to keep it spoiler-free. For reviews, check your favourite games site! In the near-future, doctors can implant memories to rewrite a patient's (remembered) life. To do so they must hop backwards through the patient's memories, from the most recent and most easily accessible, to the oldest and most deeply buried memories that need to be edited to effect the desired change in a life's course. To the Moon's story is multilayered. Like the outermost layer's sci-fi memory-hopping premise, the layers are exposed progressively until the game itself eventually reveals in its entirety what it is. To the Moon is philosophical sci-fi, an engaging mystery, a bittersweet romance, and a Shakespearean tragedy. All of the layers engage and make each other meaningful, even (in hindsight) before they are made overt. The outermost layer defines the overall framework of the story in reverse chronological order. But this memory-hopping is more than just a narrative gimmick. By the end of To the Moon we're forced to question whether happiness exists in a moment or across a lifetime, whether the people we love and have lost exist as anything more than memories - and what is the worth in those memories. To the Moon's ending is open to interpretation, but not in the usual lazy way of leaving details obscured. The details of this story are concrete, although often subtle. No, the interpretation depends entirely upon our answers to those philosophical questions the game poses. The game opens with a mystery: why does a dying old man, Johnny, wish to go to the moon so desperately that he would rewrite his life to do so? And even more intriguingly, why doesn't he know the reason himself? This premise also neatly keeps the story free from artifice: the narrative never unfairly hides anything for a cheap twist later on. There is a twist, but it is a thing to marvel upon as the implications to all layers of the story become clear. It's a twist not because it shouldn't be revealed early but because it cannot be revealed early. The best kind. Underneath the sci-fi and the mystery lies the compelling pathos of the third layer: the characters. It's here that we engage with the likeable doctors, and fall in love with Johnny and River and their awkward, bittersweet romance. This is where To the Moon captures your heart and doesn't let go until the end of the game. It sustains the entire game with wonderfully-written amusing, sensitive, and heartbreaking dialogue. This is how we come to care about the philosophical and ethical implications of rewriting memory. This is why we're driven to keep playing. And here too is the central theme of the game: autism. Not memory-hopping, not love and loss, but Autism Spectrum Disorders and the particular challenge they all present: communication and connection with others. To the Moon explores with exquisite tenderness the fundamental need to connect with people, a need that isn't any less in those with a condition that makes it so difficult to do so. We watch in helpless sympathy as River struggles to express herself to someone she loves and needs, in a confusing social world that she cannot understand. In turn, Johnny's stoic, steadfast support for a woman that he knows he will never truly know is deeply touching - even, or especially, when his only-human selfishness shows. This is the gentler, subtler tragedy of miscommunication that we can all relate to on some level. This is what To the Moon is really about, even though it's heaviest punch is yet to come. Because To the Moon is a Shakespearean high tragedy, as well, and that tragic singularity at its core is the twist that unifies all of the layers above it - the sci-fi memory-hopping mystery, the sweeping romance, and the gentle study on autism - and shows that everything you might have thought was superfluous presentation or cheap emotional manipulation actually makes a perfect, beautiful, terrible, heartbreaking sense. "Tragedy" is an oft-misused word. A car accident is not a tragedy. The death of a loved one is not (necessarily) a tragedy. A key requirement of tragedy is that there is always some way - some simple, easy way - to avert it, that it doesn't have to end that way... Except that in some sense the tragedy always was inescapable, that the individuals were driven by their nature to some inevitable conclusion. The slow constriction of possibility into inevitability is what makes tragedy such a powerful narrative structure. The question of free will is therefore fundamental to tragedy. Tragedy requires that the hero be free to avert it, but does not. Tragedy requires that the choices leading to it be driven not by random whimsy but by the definite character of the hero. Tragedy exists within the tension between freedom and inevitability. Tragedy, then, is inherent in Autism Spectrum Disorders - these are disorders that are infamous for constraining the behaviour of those afflicted, and almost always set a course for conflict with an incomprehensible and seemingly hostile social world. To the Moon explores the tragedy of ASD on two levels. First, there is the everpresent subtle tragedy of miscommunication that provides pathos at the character layer throughout the game. Second, there is that singular event, the Shakespearean high tragedy. Tragedy is driven by the character of its heroes, and To the Moon uses ASD as an unusual but compelling device to serve this purpose. A lifetime of apprehension and confusion over Johnny's seemingly callous behaviour, and the ultimate destruction of a lifetime's memories, could all have been averted if only River could communicate what it was that troubled her - but of course she couldn't, and so it wasn't, and that is the tragedy. The tragic structure of the narrative isn't even apparent until the last act of the game, when the singularity at the story's core is revealed. Until then, the narrative's impact comes entirely from the simple pathos of the higher layers, which, thanks to excellent writing and characters, is powerful enough on its own to engage you and impel you headlong through the game. But when the real tragedy is finally revealed, it slams all of that accumulated pathos into you at once, illuminating everything that you were already emotionally connected to under a new, Shakespeareanly tragic light. The common (mis)usage of "tragedy" is simply to describe a narrative with strong pathos and sad ending. Notably, To the Moon doesn't have a sad ending - depending on how you look at it - but it's a truer tragedy than many narratives that lay claim to the name. There's something else that exists within the tension between freedom and inevitability - video games. As game developers we are always exploring this fascinating region bounded by simulation on one side and cinema on the other. Just as tragedy funnels a character with the illusion of freedom to an inevitable conclusion, so too do games. The same illusion of freedom that makes tragedy powerful works for games. And let's be clear: freedom is an illusion in all games, no matter how open they appear. To the Moon isn't good gameplay in the usual sense of the word, but it uses the nature of video games very aptly to explore tragedy. It could be (and is) criticised for being more like a movie than a game, but that's missing the point. It's not a movie, regardless of how little gameplay it does have, and even that small illusion of freedom makes it more powerful - in a fundamental way - than a movie can ever be, for the same reason that true tragedy is more powerful than a story with a sad ending. To the Moon belongs unreservedly within the video game fold, and video gaming is so much the richer for having it here.